When was the last time you spoke to your family? Was it this morning, last week, perhaps even a month ago? Whether you regularly keep in touch or have more of a long-distance relationship, the holiday season always presents the perfect opportunity to re-connect. Last year it was estimated that 2.88 million people took to the skies for Thanksgiving weekend to see family. But for some, seeing loved ones in person at this special time of year just isn’t possible. That’s why traditional family-owned company Bauducco Foods decided to bring people closer with a very special experience. 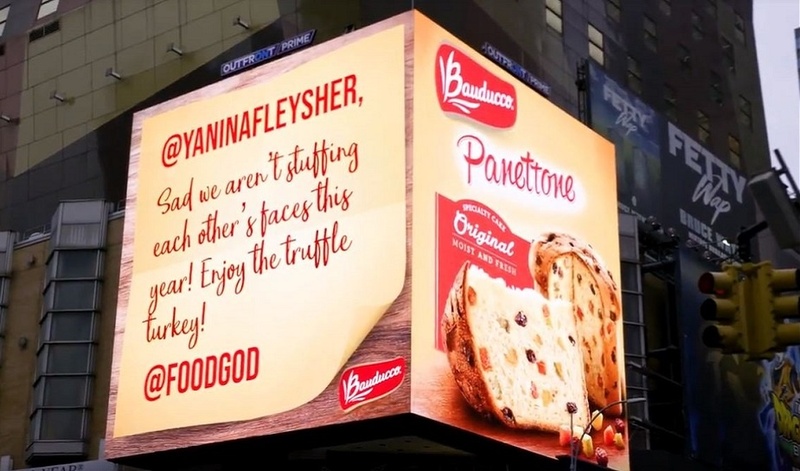 The baked goods brand brought a heart-warming campaign to the heart of Times Square to reach the millions of diverse visitors to New York City’s tourist hot spot. Over a period of four hours, the brand interviewed people about their plans for Thanksgiving and asked them to share personal messages to loved ones. Little did the participants know that their messages would appear in real-time on a giant digital billboard for all to see. The emotional and surprised reactions of those involved when they turned around to see their messages live on screen in such an iconic location was hugely impactful and reinforced the importance of family during the holidays. Adding further value to the experience, brand ambassadors handed out free samples of panettone for passers-by to enjoy. To amplify the campaign through digital channels, the brand also recruited a mix of social media nano-influencers to help spread the word. Surprising and engaging, the experiential approach pulls at the heart strings and helps to strengthen the brand’s association with the holiday season and moments shared with family. The strategic activation also mirrors Bauducco Foods’ heritage; the family brand was proudly founded by Italian immigrants in the 1950s and in the US, Thanksgiving celebrates the country’s roots in migration. Bauducco’s popular panettone is also often enjoyed over the holiday season. Times Square is a hot destination for brands to get optimum visibility, reaching a rich tapestry of people. The Jamaica Tourist Board’s giant stress ball and Toyota’s climbing wall are two other great examples of experiential campaigns that stole the limelight in Times Square.